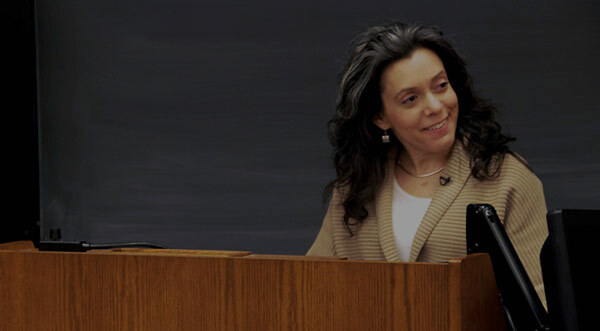 In this lecture, Professor Freeman discusses the experiences of African Americans, women, and Native Americans during the Revolution, framing her discussion within a larger historical debate over whether or not the Revolution was “radical.” Freeman ultimately concludes that while white American males improved their position in society as a result of the Revolution, women, African Americans, and Native Americans did not benefit in the same ways. How Radical Was the Revolution? Professor Joanne Freeman: I now actually want to move on to the topic of the real lecture today, and I’ve titled the lecture “War and Society.” And I mentioned on Tuesday’s lecture — at the very end of it — I mentioned that although the Treaty of Paris formally ended the fighting of the American Revolution, that there were a lot of things obviously, clearly undecided at that point. And I mentioned two things which are very logical things to have mentioned. I said that, who knew what kind of a society this new nation was going to have, and who knew what kind of government was going to be governing over this new nation. And in a way the remaining lectures in this course — And it’s kind of shocking that there actually aren’t all that many left — I think they’re all done by Powder House Day as a matter of fact. But in a way, the remaining lectures are going to be talking about society, what kind of society would emerge from the Revolution, and what kind of government would govern over that society. So those two questions are actually the very two questions that are in one way or another going to be thematically linking together the rest of the lectures in the course. And in a way, those two questions relate back to some of what I talked about at the very beginning of this course. Hopefully, you remember. If you don’t, I guess you can go look at the syllabus, but hopefully you remember. I mentioned — I read quotes from John Adams and from Benjamin Rush, both of them trying to define what they thought the American Revolution was. Right? Was it the fighting? Was it before the fighting? Was it after the fighting? And in a way, the next lectures, today and those to come, are going to address those questions in a variety of ways. So today we’re going to be talking about society; what kind of society was America going to have in this experimental, brand new nation? Now there are any number of ways to discuss this question, and the approach that I’m going to take today is to look at some specific parts of American society and see how the Revolution affected them, to see how things looked for them — these parts of the American population — how things looked for them in the wake of the Revolution, because in one way or another these populations all had a vital impact on the fighting of the Revolution, and in one way or another they were all dispossessed of power. So today we’re going to look at how the Revolution affected African Americans, women, and Native Americans — and in a sense looking at how these three populations fared in a Revolution dedicated to defending rights and liberties is a way of judging how radical the Revolution was. Now this is certainly what some historians have argued, and in particular there was a really interesting debate on this topic that broke out in the wake of the publication of Gordon Wood’s Radicalism of the American Revolution, and I’m sure — I don’t think it’s next week — I think maybe it’s the week after when you read the final section of Wood. And I’m sure that in that discussion section when you get to the final chunk of that book, this conversation will probably come up based on some of what I’m talking about today. But when that book first came out, a number of historians stepped forward and said: No — basically — no, the Revolution was not all that radical. And they argued that: well, okay, Professor Wood, of course you consider it radical. You don’t really talk about slavery. You don’t talk very much about women. And you really don’t talk about the South very much; you focus largely on the North. So these historians said: Well, when you look at the Revolution that way it looks radical, but what about when you include slavery, women and the South? How does the Revolution look then? Well, this debate ended up being put into print in one of the leading academic journals of early America. It’s called The William and Mary Quarterly and they actually published the whole debate. So they published three or four scholars arguing that the Revolution was not radical in the way that Wood’s book states, and then they let Wood have a comeback, and so they have his reply to the historians who just refuted his book. It’s a really interesting conversation. And the commentators brought up the issues that I’ve just named. Right? What about slavery? What about the role of women in society? What about the South? And here is a sample sentence from Wood’s response. He wrote that it is, quote, “inconceivable,” apparently, to his critics, quote, “that any white males in the past, unless they were sailors … or very poor, could ever have been oppressed or have felt oppressed. They imply that only those who are oppressed or marginalized in our own time were capable of being oppressed two centuries ago. If the Revolution did not totally abolish slavery and fundamental — fundamentally change the lot of women, then it could not possibly have been radical.” So clearly he’s refuting them, saying: Well, hey, can’t white males also have been oppressed and have a radical change? This debate is really interesting in part because it gets very heated. You can really see the passions of all the historians involved, Professor Wood included. They’re very engaged in this. They have a lot at stake. You can kind of see how passionate historical debates and arguments can get. But obviously, also part of why they’re get all heated is because the Revolution in many ways is America’s defining event. So it sort of — it matters for us to think about what it means, what it meant, what it meant to different people. What did the Revolution really mean? And the debate over Wood’s book touches on these kinds of questions. Now one small part of the problem in grappling with this question is a natural desire I think that many of us have — and actually people even did this in the eighteenth century — and that is to compare the American Revolution and the French Revolution. Right? People did that at the time. Sometimes people do that today. So if you’re thinking about: well, was the American Revolution radical, some people say: Well, compared with France it wasn’t very radical at all, was it? Look at what they were doing over there in France. And certainly when you compare what happened here with some of the more radical, extreme guillotine-based things that were happening in France, it might look less radical here. And in comparison with the really deep-seated changes in French society, like the ousting of an established aristocracy and the killing of a king and the initiation of a new social order — right? — that’s big, big, big change. In comparison with that, you might argue that changes in America seem tame in comparison. Some might argue that the American Revolution, unlike its French counterpart, was essentially a political protest against a distant central government’s interference in the local affairs of a people who were long accustomed to govern themselves — basically that the American Revolution was not a social revolution. I’m not necessarily defending this argument — and as you’ll see I’m not necessarily defending any argument — but I’m certainly stating here a number of different things that people have argued. And actually what I’m going to try to do today — I’m going to discuss these populations that are at the heart of this debate about the radicalism of the American Revolution. I’m going to talk about African Americans, women, and Native Americans and how they fared, how the Revolution affected them and how they experienced the Revolution. And part of the aim of this is going to be that learning how these populations fared will give us some insight into the formation of American society in revolutionary and post-revolutionary America. But what I’m going to really try to do as I talk about this today is, I’m going to try really hard not to answer that question I raised about was the Revolution radical or not — the debate that I mentioned in The William and Mary Quarterly. I’m actually not going to weigh in on what these changes mean, and I’m not going to do that very deliberately, because the section after next when you discuss this, I really want you to debate it. I’m not going to tell you my opinion. It might leak in. I hope not. I’ve tried really hard to banish it. I don’t want you to have my opinion. I want you to really debate this when you’re reading the last chunk of Wood’s book, and thinking back over the course, thinking back over lectures and readings, think to yourselves — what do you think about the radicalism of the Revolution. And so the lecture today and what I’m talking about today is going to be fodder that will feed into that conversation. Okay. So, I want to start by talking about African Americans. Now certainly the period of conflict, of actual fighting during the Revolution, really stirred things up in the realm of slavery in a number of ways. For one thing, on the sort of simple, basic level of logistics, the war just created confusion and disorder, and because things were disordered in wartime it provided some opportunities for slaves to escape. So just the mass confusion of war enabled some slaves to flee plantations and perhaps to pose as free men. Equally important, the Revolution spread its message to black Americans as well as to white Americans. The message of the Revolution or maybe the messages, plural, of the Revolution were not invisible to black Americans — free black Americans or enslaved black Americans. Regardless of whether they were free or enslaved, people could hear these messages, this rhetoric of liberty and freedom, and translate it into their own lives. And you can see both of these things; you can see the impact of the confusion of war and you can see the impact of the messages of the Revolution, in the actions of the British — or actually, of Virginia’s colonial governor — but I’m calling him “the British” because he’s loyal to the King — in 1775 in Virginia, and then the response of slaves in Virginia. Now logically enough during the war, the British — among the things that they’re trying to do is to — Creating chaos would be happy for them to do. Right? That would just sort of give more of a disadvantage to the Americans. So the British are trying to think of ways to make things difficult in America, and certainly that’s the case in Virginia. And one of the ways in which they chose to do this concerned the institution of slavery. So specifically, on November 7, 1775, the colonial governor of Virginia who, as I just mentioned, was loyal to the Crown — his name was Lord Dunmore — he passed a proclamation calling on slaves who belonged to rebellious planters, and stating that any of these slaves who were willing to bear arms in the service of the Crown should flee their masters and come to the British encampment at Norfolk and fight for the British. And any slave who fled from a rebellious master and came to fight with the British, this proclamation promised that he would earn freedom at the end of the war in exchange for military service. And this becomes known as Lord — logically, Lord Dunmore’s Proclamation, November 7, 1775. Now roughly 800 slaves actually did reach Norfolk, and it’s probable that there would have been more, but it was not necessarily an easy thing, despite the disorder of war, for people to just flee from plantations, and there probably was a good deal of vigilance on the part of plantation holders. So it was not necessarily easy to run to Norfolk, but roughly 800 slaves did reach Norfolk. And with those black volunteers, Dunmore established what he called his Ethiopian Regiment. And his Ethiopian Regiment wore uniforms with a badge that declared “liberty to slaves.” Okay. So the message is really clear. However, in a battle fought in Virginia on — in December of 1775, Virginian soldiers actually overwhelmed the British and the Ethiopian Regiment and some white Loyalists, all of them sort of fighting together there, and Dunmore was forced to evacuate by sea, and he took his black volunteers with him. Now sadly, in a variety of ways, and I suppose in a way it’s not unexpected, Dunmore’s proclamation ultimately contained a lot of empty promises, sort of really amazingly sadly. Some British soldiers just couldn’t resist the temptation to sell some of these black volunteers in the West Indies, which they did. Some actually went aboard ship with Dunmore, were headed back to England and apparently there was a smallpox outbreak aboard some of these ships, and a number of these volunteers died at sea of smallpox. So things didn’t necessarily end really well for these volunteers. Now, not necessarily these volunteers, but looking a little bit more broadly at what black Americans are doing during and in the wake of the Revolution, some enslaved and free black Americans who sided with the British, instead of running to Norfolk — maybe they were in a different state or in a different situation — some of them actually, ultimately, sometimes at the end of the war, made their way to Canada. Canada’s back. Free Canada. Some made their way to Canada and in particular Nova Scotia and Quebec among other places. Historians, generally speaking, don’t have precise numbers about the number of black Americans who went to Canada, but probably we’re talking in the thousands. Now it’s important to note here that I’ve just been talking about people running to freedom and free black Americans. I’m not meaning to suggest that Canada is a slave-free zone, because it wasn’t. And as a matter of fact, Loyalists, white Loyalists who went to Canada after the war and happened to be slave owners, brought their slaves with them. So it’s not as though Canada was this sort of happy freedom zone. For some people, as I’ll mention in a minute, it was somewhat, but for many other people, they were slaves in America; they were slaves in Canada. There were a number of free black men who immigrated to Canada and once they were there, they assumed logically that they deserved the same benefits that white Loyalists were getting from the Crown. So these are free black men who sided with the British, they go to Canada, and the Crown had promised white Loyalists sort of any number of things, including land grants, as a reward for being loyal during the Revolution. These free black men also go to Canada, assuming they’ve been loyal and they deserve land grants in Canada. And there actually were some free black men who did get land grants in Canada. However, of course this was not an entirely fair process. So you have white Loyalists being given grants of hundreds of acres of land; you have black Loyalists being given sometimes as little as one acre of land, sometimes as much as fifty acres of land, nowhere near sort of parity, nothing equal going on here. And apparently also, areas in which black Loyalists were given land tended to be segregated off. So we’re not talking about equality, we’re not talking about a slave-free zone, and we’re not talking about sudden equality of status. Now of course, slaves did not just serve in the British Army, or only ally themselves with the British. Some joined the Continental Army, as did some free black Americans, though at the outset, the Continental Army forbade the enlistment of African Americans. So at the beginning of the war, this was not something being discussed. However, after the war had been dragging on for a while, certainly longer than people thought it would, and the Continental Army and Congress really began to be desperate for manpower, suddenly this issue was revisited, and at least in the North, some states began to enlist black soldiers to fight in the Continental Army. By the end of the war, most of the states — some of the obviously Southern states are holdouts here — but most of the states had recruited some black soldiers. Roughly 5,000 black soldiers served in the Continental Army, logically enough most of them from the North. The majority were slaves serving with their masters’ consent in separate black units. Some hoped to be fighting towards their emancipation, so again on a really personal level, did feel like they were fighting for freedom, not just American freedom but personal freedom. And an example of this — just this mentality — You can see this in the 289 identifiably black men in the Connecticut forces. Of that — those 289 black men, five of them when asked to give their surname, reported that their surname was Liberty when they signed on. Eighteen when they signed on reported that their last name was Freedom or Freeman. And I have to say, speaking as Joanne Freeman, my Eastern-European ancestors had the same impulse at Ellis Island I think: [laughter] Freeman. So I understand. But you can see there, you can get a sense there, of the mindset of what — behind what people are doing. So we’ve seen in a variety of ways here that the war shook up the system of slavery in several ways. We’ve seen that the message of the Revolution certainly had an impact on America’s slave population. The Revolution also changed the views of some white Americans regarding slavery. Given the Revolution’s message of liberty and the ways in which Americans actually did regularly use the rhetoric of enslavement to describe their relationship with Britain — right? We are not slaves. They are treating us like slaves — some white Americans were moved to take action on the issue of slavery. Now of course, some foreign observers were pretty quick to see the irony in a slave-holding society crying out for liberty and freedom. And the most famous example of this — many of you may have heard this quote already — is from Samuel Johnson, who said, “How is it that we hear the loudest yelps for liberty from [correction: among] the drivers of negroes?” He just pins the point right on its head. But some people were actually moved to action. For example, ideas early in the war that we talked about earlier in the course about boycotting certain items of trade, like the Continental Association, those ideas inspired some Americans to seize the opportunity to prohibit trade in slaves as well. And some of the more radical colonies like Pennsylvania, Connecticut, and Rhode Island — I want a rousing cheer for Rhode Island — some of the more radical colonies actually passed acts prohibiting the slave trade during the war. So Pennsylvania in 1773 did that; Rhode Island and Connecticut in 1774 did that. Between 1777 and 1784, five states actually ended slavery — and I’m going to come back to a moment as to what I mean when I say “ended slavery” — Vermont, Pennsylvania, Massachusetts, Rhode Island, and Connecticut, though in many cases they proposed gradual emancipation — so again this is not instant end of problem — for example declaring all children born of an enslaved woman to be free after a certain date. Quakers were also moved, or at least some Quakers were also moved to act against slavery, and certainly by the end of the war some Quaker slave owners had freed their slaves. I think a pretty hefty percentage of Quakers actually freed slaves. Sometimes black Americans were spurred to action. So for example, in states that considered slaves to be not only property but also people before the law, like Massachusetts, there were actually some slaves who brought suit against their masters for freedom. Now these kinds of attempts may not have often been successful, but they certainly had the potential to force slave owners to grapple with the idea of slavery, with its legality, with its morality. So as far as slavery is concerned in the North, the Revolution caused some change, though there was still a general refusal to offer freed blacks full membership in the political community or to raise their social status. But in the South, slavery emerged from the Revolution as a firmly entrenched sectional institution. Now of course, the South was economically dependent on the system of slavery. In a way, the Revolution only made this more obvious to southerners. Military occupation by the British, British attempts — as in Lord Dunmore — to use slavery as a tactic to upset the American cause: those sorts of things seemed to really threaten the social order of the South, and many Southerners responded by deciding that the restoration and regulation of slavery was indispensable for the rehabilitation of the South after the war. So the result was the further entrenchment of slavery throughout the South, although I think a little less so in Maryland. So for example in some states where a large percentage of the slave population had been lost in various ways, planters began to import slaves from Africa in earnest in mass quantities. So for example, South Carolina lost a large percentage of their slave population in one way or another during the war. Before 1800, they had imported almost 20,000 Africans to South Carolina. And obviously, as we’re going to see in future lectures, given this divide over the issue of slavery, it became a continual deal-breaker whenever any sort of national initiative was being discussed, like the drafting of a new Constitution. Again and again over the course of the next few decades, the issue of slavery would be raised and then dropped, sometimes immediately dropped, always being sidestepped as just being too dangerous to handle in a fragile new union. And obviously if you look far down the road, this kind of behavior was no solution, because way down the road we end up in a civil war. Now as I said at the outset, I’m going to let you discuss for yourselves in a couple of weeks, thinking back over the semester, about the implications of the information that I just gave you, about slavery and whether or not this constitutes radical change. What does this mean? Now I want to turn to the question of women and how the Revolution affected them. And I’ve already mentioned in past lectures how women were politicized with the resistance effort. Boycotting British goods is an act of — It’s a political act ,and women are often the people who are purchasing goods — that the need to spin and weave homespun cloth, because British manufactured goods are being boycotted — again, that’s a really political act. So some of the daily actions of women became politicized during the Revolution. And there were some women who were even more overtly political: drafting petitions, participating in mass political events. In North Carolina in 1774, as an example of some very politically activated women, fifty-one women wrote out a resolution declaring their allegiance to the American cause. In 1780 in Philadelphia, thirty-six women apparently created and ran an amazingly successful campaign to raise money to equip American troops, and supposedly in a matter of weeks these thirty-six women raised roughly $300,000. Those are sort of active, amazingly effective women. So there are some women that are really explicitly sort of campaigning politically, but this doesn’t mean that women were wholeheartedly welcomed into the political community. Of course, they didn’t have the franchise, except briefly in New Jersey. This is a New Jersey moment. Is anyone here from New Jersey? Oh, we have many New Jersey people. New Jersey shines right here, well, at least for a little while. We have a shining New Jersey moment. Believe it or not, [laughter] for a little window of time in New Jersey, women had the vote during this time period, in direct consequence of the principles of the Revolution. And the way that this worked is that basically as a new state, New Jersey created its own constitution, a new constitution, in 1776. And apparently that constitution had gender-neutral language in it, and it referred to inhabitants voting, inhabitants who could meet a fifty-pound property requirement, so any inhabitant who had those fifty pounds could vote. Now obviously, that did not explicitly mention women, but in 1790, state legislators in New Jersey passed an electoral statute explicitly affirming female suffrage, and used the word “he” and the word “she” in discussing this, so they were very straightforward about it. Now in point in fact, only small numbers of women voted because except for a small number of wealthy widows there were not that many women who could satisfy the property requirement. Still, beginning roughly in 1797, small numbers of women, probably a few hundred in any given election, did vote in New Jersey in both state and national elections. It’s a little happy New Jersey moment. However, in 1807 some election fraud and I suppose, lingering and persistent anxiety about exactly what female suffrage meant, led the New Jersey legislature, people of all parties in the New Jersey legislature, to pass a law explicitly prohibiting women from voting. So literally it’s this little window, a couple of years, and then suffrage is taken away. Interestingly, historians have not found much protest on the part of New Jersey women, and there was not actually a lot of response as to what it meant to lose the vote, but again that might be because we’re talking about such small numbers. Interestingly, during roughly that same little window of time, a few states experimented with black suffrage in their first state constitutions. So New York, New Jersey, and Pennsylvania for at least a time in their new constitutions allowed free black men to vote. This did not last for a very long time, and as a matter of fact New Jersey, when they took the vote away from women also took it away from free black men. So there’s a little window when some states are willing to experiment with this idea and then that experiment is ended at the beginning of the nineteenth century. So, window of opportunity, not a long-standing change. Even so, women post-Revolution did have something of a more established political role in the community-at-large, and it’s as wives and mothers, but it’s not just: ‘go be a wife, go be a mother, thank you very much, that’s good for the polity.’ It’s actually a little bit more complicated than that. Basically, as the republic got under way, it was assumed that women would have an important political role to play, and this has to do with the nature of a republic. A republic is supposedly grounded on a populace that understands its liberties and rights, is vigilant to protect those liberties and rights, knows what it’s supposed to be doing as citizens, knows how to act as a good citizen. A republic is grounded on its citizens, the activities and the vigilance of its citizens. So in a republic, it’s really important for people to understand what it means to be a small-“r” republican. So women, as the people who are literally mothering new little republicans being born all the time, were seen to have an important role to play as the people who were literally schooling their children to be good republican citizens. And there is a historian named Linda Kerber and — she is actually in your Major Problems — There’s an excerpt of what I’m talking about here that’s in your Major Problems textbook. This historian named Linda Kerber came up with a phrase to describe this politicized role and she used the term “republican motherhood” to describe it, and historians really liked that phrase and they took it and they ran with it, so now you see republican motherhood all over the place. A lot of people talk about republican motherhood. A few people said, ‘Well, actually, I think it’s more like republican wife,’ but one way or another the idea was one that was popular with historians and they ran with it. Now I mention republican motherhood partly because I think it’s a nicely descriptive phrase that kind of sums up what I just said, partly because historically it’s significant and historians — if you read about women in the Revolution, you’re going to see that phrase all over the place — but I do want to note here, having just mentioned it, it’s not like people in early America were walking around claiming to be republican mothers. That’s — Actually, it’s not something from the time. It’s a modern idea that’s being imposed back to explain behavior from an earlier time. So it’s not like people were sort of using that phrase in the period that we’re talking about. Now to be a good republican mother, a woman needed to be well-educated, obviously so she could educate her children. So in essence, if you were going to raise solid republican citizens, they needed to be good, solid republicans themselves. So logically enough female education got something of a boost after the Revolution, and throughout the country there were a number of women’s academies and schools formed for advanced learning for women that had not been there before. There was a lot of attention being paid to female education. You see it in public discussions at the time. People are actually talking about — Men are actually talking about what is the proper education for a woman, what should be happening, where should things be going, what should we be doing, what’s best for the republic. Now I’ve already talked about how with the issue of slavery, thanks to anxieties raised by the Revolution and fears about social disorder, some Southern states responded by focusing even more deeply on more deeply entrenching the system of slavery. Not surprisingly, in the case of women, there were some anxieties raised by the implications of the Revolution regarding their status and their actions as well. It can be a little harder to see but it is there. And one of the interesting places where — Gosh. It’s been a number of years. A number of years ago I stumbled across newspaper essays, and I thought they were really fascinating, and they bear light on this. Eighteenth-century newspapers — We’ve seen them. They’re short. They’re a couple of pages. Sometimes — in the newspaper we looked at I don’t think there was one — but sometimes they would have little satirical essays, usually with some sort of political commentary or maybe social commentary attached to them. And what I stumbled across — and I think both of these examples are from 1789 or 1790, so the government has just gotten under way — I found these little satirical essays, both of which were kind of showing anxieties about women having political power and making fun of women with political power. So I found one essay that pokes fun at women who are so informed politically that they know the identity of all the people who write with pseudonyms in the newspapers. And so it was this little sort of sarcastic essay, sort of: well, you women, you bad mothers who read the paper and you know who Publius is, but you don’t know where your child is. It’s sort of — It was meant to be funny, but that was the tone: bad mother, good politician, bad mother, bad, bad, bad for America. And there was another one that was using satire to poke fun at the idea of women applying for the position of Doorkeeper of Congress. No symbolism there. And it was an essay that was well: what does that mean, a woman applying to be the Doorkeeper of Congress, acting as though that had happened and then kind of making fun of the implications of what it would mean if a woman had sort of a political role with an actual political institution. So both of those things were really interesting to me because they — they’re not directly saying, ‘Wow, we’re really anxious about the implications of the Revolution regarding women, so we’re going to write really anxious little essays,’ but that’s basically what they were — was showing some anxieties, showing awareness of change, and not necessarily being all that happy about what that change might mean. Okay. So we’ve seen some ways in which the Revolution affected women. I want to turn, before I run out of time here, to Native Americans as a final sort of test case on the bounds of the American Revolution. Now, Native Americans had a complicated experience of the American Revolution and it was complicated in many ways. For one thing, they were being courted by the British, and the British have long had a presence in Western frontier territories, so they had experience dealing with Native Americans. Obviously, also, Native Americans were living on land that was constantly, deeply desired by Americans of various sorts. And even before the Revolution, white American settlers didn’t need much of an excuse to wage an attack on Indians to get land, so that’s even before the impact of the Revolution. Not surprisingly, Native Americans that sided with the British really complicated their relationship with white Americans. Americans basically struck back. So for example in 1776 and 1780, even as the Revolution is still going on, you had Americans attacking the Cherokee Indians. In 1779, Americans attacked the Iroquois. In 1780 and ‘82, they attacked the Shawnee. So even as the Revolution is going on, Americans are acknowledging that they’re — they feel threatened by Native Americans, they understand that there’s a link somehow between British and Native Americans, and they’re waging attacks there as well as everywhere else. The Treaty of Paris did not help matters. The treaty ceded to the United States British holdings east of the Mississippi River. But given that logically enough there were no Native American representatives at the treaty negotiations in Paris, Native Americans were stunned to discover later that their territory had just been signed away by the British and given to the Americans. One member of the Iroquois told a British commander who was posted out on the frontier that, quote, “If it was really true that the English had basely betrayed them by pretending to give up their Country to the Americans Without their Consent” — I like the fact that it’s “pretending” — “without their Consent or Consulting them, it was an act of Cruelty and injustice that Christians only were capable of doing.” A really strong statement. Even so, when American commissioners went west after the treaty had gone into effect, they were operating under the idea that in defeating the British they had also defeated Britain’s Native American allies; they were the conquerors, they had been given the land, and they actually assumed when they headed west and were treating with Native Americans that they were being generous by giving back to the Native Americans some of what had been theirs but was no longer theirs. This was a really nice theory, but in fact, as Americans would discover over the course of the 1780s and even into the 1790s, as much as they could claim that they had conquered Native Americans, the new United States and Americans in the new United States had no ability to act like conquerors, no physical ability to act like conquerors. They just didn’t have the military power. And throughout this period as American settlers moved west, Native Americans went to battle, defended their land, and often American attempts to quash these attacks were disastrous for the Americans. And as an example of what we’re talking about here, in 1789 the national Army of the United States, whatever was of it, had roughly 700 men. The Creek Indians alone had between 3,500 and 6,000 warriors. Okay. We’re not really powerful as far as being a sort of national presence demanding or commanding anything. For the Native Americans, the disastrous impact of the Revolution inspired many of them to become more united and not just as individual tribes, but it actually united different tribal groups together explicitly based on the idea that they were different from white people and needed to unite against them. Tribe and tribe and tribe and tribe together needed to form unity in a way in which they hadn’t necessarily done before to unite against white people. Now this wasn’t true for all Native Americans, nor did all of them assume that their only option was war. Some did decide to try to blend in to communities — black communities, white communities — and white Americans throughout this period, some of them at least, also were busily trying to convince some Native Americans to just take up agriculture and sort of blend in. If they could take a little plot of land and begin farming, some Americans thought that maybe that would be an alternative to warfare, that native Americans could kind of become part of American society. Thomas Jefferson talks about this some in Notes on the State of Virginia. And for many white Americans, this was the only option that they could envision that might prevent future warfare and — bloody, nasty future warfare. But as you can tell by a lot of what I just said there, in the end generally speaking the Revolution brought nothing but trouble to North America’s native peoples and that trouble would persist for decades to come. It’s interesting. I — I’m going to give a little shout-out here. I have a senior essay writer — Senior essays are on my mind, since all I’m doing is reading drafts of senior essays. But I have a senior essay writer who is writing his essay on the fact that there’s a little, tiny window — we’re talking about a lot of little, tiny windows — a little, tiny window at the beginning of the new government under the Constitution, and there was a brief period in which the national government thought well, maybe we can actually have sincere diplomacy with the Native Americans; we can sort of treat them like a foreign nation and do something that will maybe waylay problems. It’s not a window that lasts very long, and when that window is over, there is more nasty warfare, but that’s what this senior essay is about, that little window that this essay argues is often not recognized because people look to sort of Jackson wiping out Native Americans, and they just transpose that back across time, and they don’t really acknowledge that this little bit of diplomacy here was serious. They sort of assume — Some historians assume that it was just a delaying measure while Americans built up troops. So anyway, in one way or another the Revolution brought nothing but trouble to native peoples, and that trouble obviously continued and in a way got worse in years to come. Okay. So we’ve looked at the impact of the Revolution on African Americans, on women, on Native Americans. We’ve seen their experiences of the Revolution. We’ve seen some of the impact of those experience — experiences and the outcome. We’ve seen some change, some of it for the better, some of it long standing, some of it maybe not so much. We’ve seen also how change doesn’t happen in a predictable, linear kind of a way. I think there is an assumption when you think about the history of almost anything, but certainly maybe in the history of your own country, that things are always getting better. They started out sort of primitive, but they’re always getting better. And I think in particular when you look at the sort of subject we look at today, what you see is that things sort of do this. [gestures] Right? Things are not always getting better. History is actually actions and reactions, and sometimes the reaction is not so great. So, things get better, they get worse, they kind of stay the same, maybe they’re a little better, maybe they’re even better, and then they get worse again. And I think taking the long view of American history, I think that’s a more realistic way to think about how things change over time, than to assume that everything always gets better. I think these three populations show that really dramatically. However, I’m not going to tell you whether I think that means that the Revolution is radical or not. I think I successfully did not do that in that lecture; I hope I did. And I’m going to be really interested, after you meet and have that discussion, to hear what you discussed, what you think, what your thoughts are, how radical was the American Revolution. And I will end there and I will see you next week.